Researchers led by Professor Matthieu Le Tacon, director of the Institute of Solid-State Physics (IFP) at KIT, have now made a significant step forward. They have shown that high uniaxial pressure can be used to tune the competing states in a high-temperature superconductor. Using high-resolution inelastic X-ray scattering, the scientists examined a high-temperature cuprate superconductor, YBa2Cu3O6.67. In this complex compound, copper and oxygen atoms form two-dimensional structures. Changing the charge carrier concentration in these planes yields a variety of electronic phases including superconductivity and charge orders. 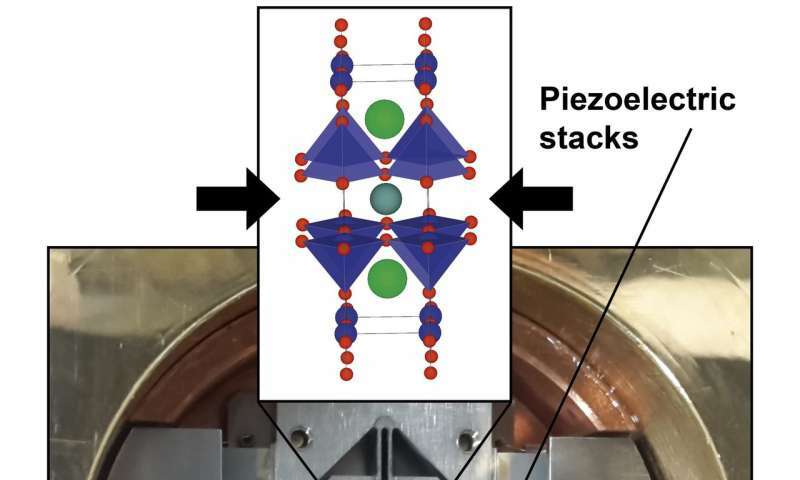 Inducing this state in YBa2Cu3O6.67 using uniaxial pressure instead of magnetic fields allowed the researchers to study its relationship to superconductivity using X-ray scattering. They identified strong anomalies of the lattice excitation connected to the formation of the charge order. "Our results provide new insights into the behavior of electrons in correlated electron materials and into the mechanisms yielding to high-temperature superconductivity," says Professor Matthieu Le Tacon from KIT. "They also show that uniaxial pressure has the potential to control the order of the electrons in such materials."